In League of Legends, one of the most played common classes is the AP mage. This type of champion deal damage mostly through their abilities and all of them, require AP items to increase their power throughout a match. But what exactly should a Mage or AP champion buy? In the third installment of our LoL items guide mini-series by PicklePants, we will discuss every item that synergizes well with AP champions. No matter which lane you’re playing, this guide will definitely help you out when it comes to that almighty question of “what item should I buy?”. We will be covering AP items that can be purchased on Supports as well as every lane where an AP champion can be played (apart from items that are limited to a lane or role like a Support or jungle item.). In our previous guides on Support Items and Tank Items, we provided the terminology and a bit of background information to help you understand how itemization works. If you haven’t read them already, I would recommend you do so. But here’s a TLDR for those who haven’t. Core items are almost always brought on your champion. Situational items are things that you may not necessarily purchase every game apart from when you need them. For example, defensive items. Are you a mage main looking for the best builds for your champion? The Mobalytics Pre Game feature gives you the optimal build from our high-ELO experts before your match begins. For example, here’s a Karthus build by our Challenger Coach, Moriarty. This is just one of the many features that Mobalytics provides, it’s quick and easy to just sign up and improve your climb! There are only two items that AP champions will start in most cases, Doran’s Ring and Dark Seal. These items synergize and work well on them over other champion classes because they provide mana and AP which allows the champions using them to deal a slight increase in damage. Note that specific champions may favor other starting items like Doran’s Shield or Corrupting Potion. The first AP item that a mage champion may choose is an item called Doran’s Ring. This is a fabulous item to take on champions who are AP because it gives them some bonus trading power in lane thanks to the ability power it provides. In addition, it also gives you some health and mana which makes laning easier especially on mages who spend their mana recklessly. Most AP champions apart from Kayle and Kai’Sa have really poor auto attacks and it makes last hitting really difficult on them. Thankfully, Doran’s Ring has a passive that allows you to deal additional damage to minions which will help you last hit more consistently. Examples of champions who benefit: Syndra, Lissandra, Kai’Sa. The second starting item that some champions like to take is called The Dark Seal. This item gives you bonus AP just like Doran’s Ring, mana just like Doran’s Ring and increased healing from potions Even though it is not the main reason for taking it, if you run Biscuit Delivery or Kleptomancy, you will get extra sustain with this item. Additionally, The Dark Seal also has a passive that grants bonus AP per extra glory you have. Glory is something that can be earned by killing an enemy, which grants 2 Glory, or gaining an assist, which gives 1. These Glory stacks can total up to 10, but you lose 4 every time you die. It is a high risk, high reward item on many champions. Examples of champions who benefit: Katarina, Vladimir, Leblanc. Advanced items, also known as upgraded, or tier 2 items, are items that have only been upgraded once. It’s very difficult to talk about every AP advanced item that is available to a mage because there are so many variations. You will need to look at the next item you intend to purchase, and from there you can check to see what advanced items are needed to complete it. Take a look at the stats that it provides and choose the advanced item you want. While not necessarily Kata’s first choice of items, if she is laning against an AD champion who has all in potential such as Zed, she may favor picking up a Zhonya’s Hourglass. Zhonya’s can provide Kata with some defensive stats as well as AP and CDR. This item also directly counters the all in potential from Zed thanks to its active which can leave you in stasis. If Zed is at his power spike and is dishing out consistent damage, Kata may want to invest in a Stopwatch to protect herself from the execution on his ultimate. She may also want to get some armor to protect herself from his basic attacks and damage output too by purchasing Seeker’s Armguard. Completed items are items that can no longer be upgraded and are basically finished. As a mage, you have a plethora of item choices and potential purchases you can make, so it’s important that you always make the right decision. Let’s discuss the items available for you. 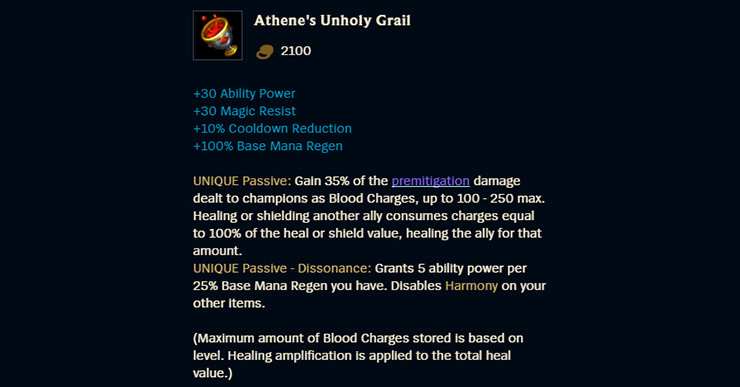 Athene’s Unholy Grail is an item that does not see much play because it’s a very specific item and only works on a few champions who have a shield and can deal damage. Athene’s grants the user AP damage, cooldown reduction, mana, and magic resist- so it gives a lot of good stuff. It’s also quite a cheap item for what it gives. However, its passive is what deters champions away from it. The items passive gives you stacks that are equal to 35% of the premitigation (raw damage dealt). If you shield an ally or heal yourself, you will consume all the charges equal to 100% of the heal or shield. So basically, if you deal damage, you gain stacks. The stacks can be consumed by shielding an ally or healing someone. In addition, you also gain bonus AP for every additional amount of base mana you gain through the game with a maximum total of 50 AP. This item is often seen on champions that can flex between the Mid or Support roles. Examples of champions who benefit: Karma, Lulu, Lux. Banshee’s Veil has a passive that provides you with a spell shield that will protect you against the next incoming ability. This is really good against pick or poke comps because it will provide you with a little more protection. For you to regain this shield, you will need to not take any damage for 40 seconds. This item also grants cooldown reduction and magic resist. Examples of champions who benefit: Syndra, Veigar. This item is not very popular because it’s a rather lackluster item in its current form. It does give a huge chunk of AP, 20% cooldown reduction (10% base CDR + 10% CDR from Haste), and mana, which is nice for the laning phase. But there are far better items around (as of Patch 9.4). Its active is also nice which deals damage and slows any champions that are hit by it. If you have this item with other Hextech items like Protobelt or Gunblade, the cooldown is the same for all of them and is universal- meaning once one is used, the others go on cooldown too. Examples of champions who benefit: Veigar, Vel’koz, Swain. Hextech Gunblade is one of the few items that give both AD and AP. Using this item on an enemy champion will deal a small amount of damage while also slow them briefly. But this active shares the cooldown with other Hextech items like Protobelt or GLP-800. Buying this item will also provide you with some sustain during team fights. Every little bit of damage you deal through either using your abilities or through auto attacking, will heal you for 15% of the damage dealt. This is reduced on AOE abilities like Syndra’s Q or Anivia ultimate to 5% of damage dealt. Examples of champions who benefit: Katarina, Akali, Mordekaiser. Hextech Protobelt is an item that gives AP, CDR, and health. It makes it a great item on champions that love to get into the thick of it and be inside when things start kicking off. The health, while minimal, will be a lovely addition to any champion, allowing them to survive for longer in team fights. Its active allows you to dash slightly forward and deal damage by shooting missiles in a cone shape as you go forward. However, these missiles or rockets are blocked by minions, which makes it difficult to hit the enemy if they’re inside a minion wave. Like all the other Hextech items in the game, the cooldown is shared if you have any other Hextech items like the GLP-800 or Gunblade. Examples of champions who benefit: Galio, Lissandra, Ekko. Liandry’s Torment gives a champion more damage and allows them to be a bit beefier in team fights. This is because Liandry’s gives them health and a lot of damage. It gives a flat amount of 75 AP, and it allows you to deal increased damage when you have an exchange with the enemy. If you auto-attack or deal damage, you will be granted a stack. If the exchange continues, you will be granted more stacks. At 5 stacks, you will gain 10% increased damage which will make your abilities really hit home even against the healthiest of enemies. This item will work silently in team fights as they usually last more than 5 seconds, allowing Liandry’s to fully stack and get to work. Liandry’s also provides a passive that is incredibly valuable in teamfights and against enemies with lots of sustain like Vladimir, Soraka or Janna. Basically, every time you deal damage to an enemy, they will be infected with an effect that reduces their health over time by basically ticking away their health bars. It also deals even more damage to enemies who are slowed or immobilized and locked in position. Liandry’s is great on champions that deal magic damage over an extended period. Examples of champions who benefit: Vladimir, Swain, Brand. While Lich Bane provides a lot of good stats like AP, CDR, mana and it is one of the few items that provide movement speed, it doesn’t work on all mages even though the stats say otherwise. Lich Bane only benefits champions who auto attack frequently or who have an auto attack reset like Twisted Fate, Ekko or Fizz because of its passive. Lich Bane’s passive gives your next auto attack more damage- which is why it only works well on these champions who can proc it consistently. Examples of champions who benefit: Twisted Fate, Fizz, Ekko. Luden’s Echo is a core item for many mage champions because it provides a whopping 90 ability power. In addition to this, it also has cooldown reduction and a lot of mana. So you can see why many mages adore this item. The Haste passive on Luden’s Echo also gives an additional 10% cooldown reduction which totals to 20% cooldown reduction for one item – fabulous! Examples of champions who benefit: Syndra, Leblanc, Zoe. Mejai’s is a very high risk and high reward item. It can be very cost efficient if you can get it stacked, but it can be rather risky to build and maintain the stacks. Basically, if you’re playing somebody who has high kill threat and can easily get kills, you could buy this item. It can also be upgraded directly from your starting item if you’ve gone for The Dark Seal. For every kill and assist you gain, you get additional stacks which provides you with more damage. However, whenever you die, you lose 10 stacks, which is a lot of lost magic damage. So taking this item is very risky because you may not always be able to stack it. Also from one mistake, you will lose so many stacks. Examples of champions who benefit: Brand, Vel’koz, Leblanc. Morellonomicon is another item that is considered a core item for many mages because it provides AP and health as well as magic penetration. Magic pen is often needed for mages, especially if the enemy has multiple tank champions or when the enemies are building magic resistance. Morello’s also has a passive that inflicts Grievous Wounds to the enemy which reduces their healing capability. This makes it a fantastic item against champions who do a lot of self-healing, or in a team that provides a lot of healing like Soraka, Vladimir or Swain to name a few. Examples of champions who benefit: Syndra, Morgana, Aurelion Sol. Nashor’s Tooth is a very specific item just like Lich Bane that only works on a handful of champions. This is because it provides attack speed. Not many mages, apart from the ones listed actually benefit from the bonus attack speed that it provides. While it does give CDR and AP, unless you’re playing somebody who auto-attacks a lot, makes use of the bonus on hit damage or who values the extra attack speed- then wave goodbye to this item. Examples of champions who benefit: Kayle, Teemo, Kai’Sa. Deathcap is essential for any mage looking to carry because it provides 120 AP, and has a passive that increases your ability power by 40%. There’s not much else to it, apart from it being an expensive item that is worth every penny. Examples of champions who benefit: Syndra, Leblanc, Veigar. Once purchased, Rod of Ages provides you with additional health, AP, and mana every minute for 10 minutes after purchasing for a maximum of 200 health, 100 mana, and 40 AP. It is great on champions that need more health to survive team fights, or who like to be in the mix of things when the team fight starts like Lissandra who loves to engage. Rod of Ages takes some time to come online though, which means you either rush this item and get it first or not at all. Examples of champions who benefit: Ryze, Twisted Fate, Lissandra. Rylai’s is an item that slows down users when they are hit by abilities. If you deal most of your damage over time like Cassiopeia, this item will help you dearly as it slows them down and allows her to catch them up. The slow can cripple immobile enemies which will allow you to deal consistent damage to them while they retreat. This item also gives AP and health and that obviously will come in handy. Examples of champions who benefit: Vladimir, Cassiopeia, Heimerdinger. Seraph’s Embrace is an upgraded item that comes from Archangel’s Staff. Archangel’s Staff on its own provides a variety of stats that rewards champions who use their abilities often. While many champions will use their abilities frequently, the champions who rely on mana to farm need to have this item. If you buy a lot of mana in general, this item will buff how much AP you have equal to 1% of your mana, so the more mana you have, the more AP you receive. Archangel’s Staff has a Tear item that needs to be stacked. The only viable way of stacking it is by using your abilities rigorously in order to get 750 stacks to upgrade it. Once your tear has 750 stacks, it will upgrade itself to Seraph’s Embrace. Seraph’s doesn’t really do too much other than it can provide you with a shield, at the cost of 15% of your current mana. Examples of champions who benefit: Cassiopeia, Ryze, Anivia. Shurelya’s is an item that gives you a range of stats to boost your overall presence in game. It gives the user some AP, cooldown reduction, and health. It also has mana regeneration which will synergize well with champions who use their abilities often. It also has an active that speeds up you and nearby allies allowing your team to get into the fight, or escape from one. Examples of champions who benefit: Vladimir, Karma, Singed. Spellbinder is a really valuable item for mage champions who deal a lot of burst damage with their abilities. It grants stacks that can be consumed and then used on enemy champions. If you or a nearby ally uses an ability, you will gain a stack. Activating this item will consume all the stacks and grant you a brief increase in damage (depending on how many stacks you have). If you’re a champion that engages like Vladimir, you may want to charge this ability first and then use it just before you engage. It also gives bonus movement speed, which will help you get into the enemies lines before total annihilation. Examples of champions who benefit: Vladimir, Syndra, Ryze. Twin Shadows is an item that some immobile champions like to buy as it gives them extra movement speed among other amazing stats like AP and cooldown reduction. It also has an active that sends out ghosts nearby to hunt and reveal enemy champions. If the ghosts come into contact with anybody, they will reveal their location and slow the enemy (keep in mind that they won’t detect stealthed champions). The active on this item can be used in many ways. For example, you can use it to slow the enemy in order to close the gap between you and them. You can use it to escape a gank or you can even use it to help you hit your skills shots more effectively. Examples of champions who benefit: Brand, Vel’koz. Void Staff is an item that gives the user ability power and magic penetration. This is a core item on many champions because it allows you to penetrate the enemies defensive stats. For many AP champions, it can be difficult to penetrate the enemy and break through their magic resist, however with Void Staff, this will not as big of an issue. Examples of champions who benefit: Leblanc, Ahri, Xerath. We’ve already touched on this item before, but Zhonya’s Hourglass is a fantastic item that many AP and mage champions buy. It gives you a range of stats from cooldown reduction and AP as well as armor. This item is often brought because it provides damage and armor, which provides mages with some defense stats against assassins or AD champions. Having bonus armor is one thing, but it’s active is what makes it essential for many champions. Once pressed, it will put you in a frozen-stasis form that stops you from taking any damage for 2.5 seconds. This means it can directly counter champions with executes. However, it does have its downfalls as it may only delay your death and not prevent it. Examples of champions who benefit: Syndra, Lissandra, Vel’Koz. Every champion has multiple choices when it comes to which items they should buy. While our build paths and item suggestions are a good basis to go by, make sure you adapt your build path to the specific situations and circumstances you’re facing. For example, if the enemy mostly has AD champions or you’re laning against an AD champion that wants to snowball, try and rush Zhonya’s Hourglass. Warding is a team effort! Doing so will allow you to control objectives and improve your team’s survivability. Don’t forget your magic penetration. When team fights start occurring during the mid and late game, you will need to buy magic penetration so you’re able to break through the enemies defensive stats. You can get magic pen through items like Void Staff. Never take multiple Hextech items. The Hextech line is not a bad line as a whole. It does help you do a lot of things. Never should you ever purchase two of these items on anyone champion as using one of them will put both on cooldown. This will work against you, especially when there are better items out there. My advice would be, when applicable, buy one and no more. As we mentioned at the beginning of the article, in the Pre Game, you can see what our experts recommend to build on your champion and when. This is useful as you can just launch it automatically before every game and get a build without having to search prior to the game starting. This is another good option because pro players are often trying to optimize their builds and do a lot of mathematical equations and research to work out what fits best. Try out some of the recommended items from the client. Each champion in the game has a dedicated list of items that Riot recommends to build, this is a pretty good option for new players. Give some of them ago and see what tickles your fancy. Thanks for reading, we hope you enjoyed and learned from this AP item guide. As always, you can find Picklepants in our Discord if you have any questions.